The girls have a Girl Scout camping trip coming up, so we cracked open our tents this weekend to make sure they were still in good shape*. Since the work part was done, we decided it would be a good idea to camp out in the back yard overnight**. Roasting marshmallows and everything***. J1 joined us for the smores but decided since she’ll be camping soon enough with the Scouts, she would sleep in her nice warm bed while me and the younger J’s braved the suburban wilderness****. It was a blast*****. *Lest anyone get the idea we are outdoorsy people, the tents have been packed away for almost eight years. A camping trip to Ft. Pickens when J3 was a baby was the last time we had them out. **It really was a good idea and we did have fun even if these astricies make it seem otherwise. ***Everything meaning marshmallows and sleeping. No ghost stories though. They creep me out. Seriously. ****Actually, I was going to let them sleep out there alone. Two sisters having fun in the great outdoors. But J1 and her mom (Nana J) had visions of rabid foxes and ax wielding psychopaths invading our back yard so I ‘chose’ to camp too. ******From Green Acres in case you haven’t wasted countless hours of your life watching TV re-runs like I have and are unaware of the great ‘Fresh Air’ vs ‘Times Square’ debate. This page will tell you about it and you get an American Gothic parody to boot. I posted this little story over on my photoblog Panhandlin’ a few months back. I’m posting it again here because I’ve been reading Consider the Lobster by David Foster Wallace and was reminded (purely for the stylistic quirk, not a comparison to the genius of DFW) of the camping story. I’ve been trying to summon the nerve to tackle the monster Infinite Jest and thought I would start with this volume of essays. If they were sufficiently fun-making I’d try to find time for the epic. Wallace is challenging for me and at times I feel like an idiot but OMG he’s fun. So after I finished CtL, I went online to explore a little more and to decide if I’m up to Infinite Jest. That’s when I read that just two months ago, David Foster Wallace killed himself. (The NYT article) I guess with my election focus at the time, I missed other news even though it was apparently everywhere. The life of a tortured genius. So I will pick up Infinite Jest soon even though I may not dive in right away. I have a few other books lined up on the runway. I think Extremely Loud and Incredibly Close will be taking off next. 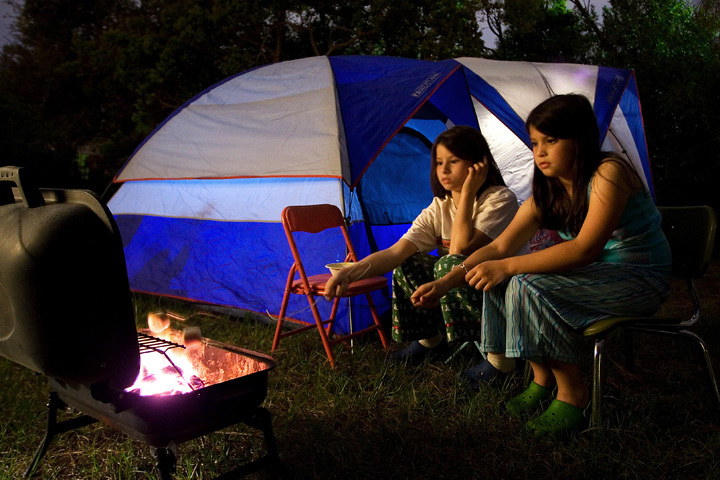 Camping out with tent very exciting for the young and young at heart, makes for great memories. Practice very good idea. Have fun.